McCall is one of Idaho's premier recreation destinations. Surrounded by premier ski areas, winter in McCall offers fantastic snow skiing and snowboarding opportunities. Tubing, Nordic skiing, sleigh rides and ice skating are also favorite New Year activities in and around McCall. 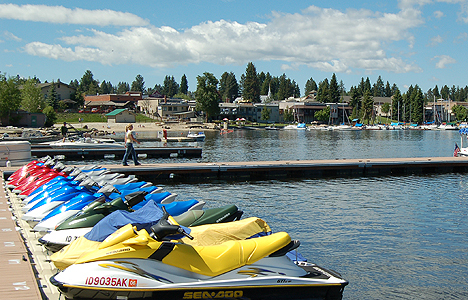 Situated on the shores of Payette Lake, McCall is within easy access of a wide range of sports, ranging from boating and water skiing to backcountry hiking and horseback riding during the warmer months. Both the Snake and the Salmon Rivers are nearby for whitewater rafting adventures. Find what to do in McCall. Davis Beach. located at the west end of Diamond Street off Davis Street, McCall, ID 82633. Phone: 208-634-3006. Bike Path & Trail System. Phone: 208-634-3006. McCall Area Snowmobilers. PO Box 354, McCall, ID 83638. The McCall Hiking Club. PO Box 697, McCall, ID 83638. Features ice sculptures and torch-light parade. Jug Mountain Ranch Golf Course. 13834 Farm To Market Road, McCall, ID 83638. Phone: 208-634-5072; Fax: 208-634-5071. Whitetail Golf Club. 501 W. Lake Street, McCall, ID 83638. Toll-free: 1-800-657-6464; Fax: 208-634-7504. Payette Powder Guides. PO Box 46, McCall, ID 83638. Phone: 208-634-4263 or 208-634-3189. Skiing is the focus of this Resort and its web site includes a web cam and weather conditions on the mountain. Nearby McCall is the home of numerous Olympic skiers. Whitewater rafting and mountain biking are offered in summer. Lake Cascade State Park. 970 Dam Road, Cascade, McCall, ID 83611. Phone: 208-382-6544; Toll-free: 1-866-634-3246; Fax: 208-382-4071. Hiking, bird watching, photography, mountain biking, all types of boating, ice fishing, snowmobiling, cross country skiing. Payette National Forest. 800 West Lakeside Avenue, McCall, ID 83638. Phone: 208-634-0700. Hiking, fishing, camping, hunting, skiing, snowmobiling. Ponderosa State Park. 1920 N. Davis Avenue, McCall, ID 83638. Phone: 208-634-2164; Fax: 208-634-5370. Harshman Skate Park. Phone: 208-634-3006. The Activity Barn. PO Box 2013, McCall, ID 83638. Phone: 208-634-2222; Fax: 208-634-1268. Cheap Thrills Rentals. 303 N. Third Street, McCall, ID 83638. Phone: 208-634-7472; Toll-free: 1-800-831-1025. Hinson Power Sports. 13924 Highway 55, McCall, ID 83638. Phone: 208-634-7007. Historical Museum. West Lake Street, McCall, ID 82633. Phone: 208-634-3006. Avalanche advisories for the backcountry surrounding the towns of McCall and Cascade.